Free tool to Print screen and store captured files automatically to a specific folder you need !!! This post is for Windows 7 users who struggle a lot to print screen and save the capture data into a JPEG,PNG etc files. In Windows 7 and prior Windows platform to capture a screen shot, you need to go through following steps. Dont you think its a tedious process. I think so. Why not use a software utility which does this task for you. 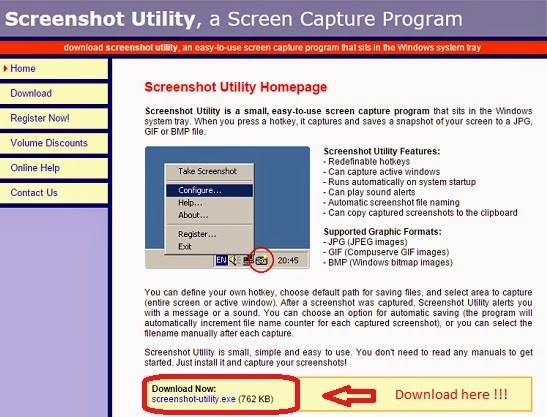 Yes there is an utility called Screenshot Utility. This is an amazing tool which doesn't much computer skills to master it. Step 1 : Download the freely available utility from Screenshot Utility to your windows folder of your choice. Step 2: Install by double clicking the downloaded executable and follow below images. Complete the installation process by choosing restart later and clicking Finish button. Now a small Camera icon pops up in your system tray. Its Screenshot Utility icon to change any settings or preferences. Right click on the Screenshot Utility icon and select configure option. Configuring Screenshot Utility is pretty easy and options are self explantory. Choose your hot key using different key combinations of your choice. I have choosen Ctrl+Alt+F12. Choose to capture either the entire screen or only the active window. Which is very useful feature. Option to choose Basefile name. This is very important, if you are capturing multiple shots at a time for any post or blogging. Finally when you press hot key (in my case its Ctrl+Alt+F12), it captures and stores the screen shot into the Directory specified in above "Configure Screenshot Utility". It even displays following pop-up menu. Amazing and simple isn't ?